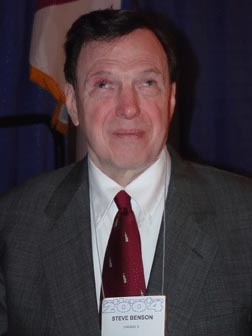 A number of years ago the Blind Educator of the Year Award was established by the National Organization of Blind Educators (the teachers division of the National Federation of the Blind) to pay tribute to a blind teacher whose exceptional classroom performance, notable community service, and uncommon commitment to the NFB merit national recognition. Beginning with the 1991 presentation, this award became an honor bestowed by our entire movement. This change reflects our recognition of the importance of good teaching and the impact an outstanding blind teacher has on students, faculty, community, and all blind Americans. This award is given in the spirit of the outstanding educators who founded and have continued to nurture the National Federation of the Blind and who, by example, have imparted knowledge of our strengths to us and raised our expectations. We have learned from Dr. Jacobus tenBroek, Dr. Kenneth Jernigan, and President Marc Maurer that a teacher not only provides a student with information but also provides guidance and advocacy. The recipient of the Blind Educator of the Year Award must exhibit all of these traits and must advance the cause of blind people in the spirit and philosophy of the National Federation of the Blind. The Blind Educator of the Year Award is presented at the annual convention of the National Federation of the Blind. Honorees must be present to receive an appropriately inscribed plaque and a check for $1,000. Nominations should be sent to Steve Benson, 7020 North Tahoma, Chicago, Illinois 60646. Letters of nomination must be accompanied by a copy of the nominee's current r�sum� and supporting documentation of community and Federation activity. All nomination materials must be in the hands of the committee chairman by May 1, 2005, to be considered for this year's award. For further information contact Steve Benson at (773) 775-9765.